Activate the Connector license. The Quality Center Connector is licensed separately from TestComplete, and has the same type as your TestComplete license. If you have a Node-Locked license, activate it using the Help | Activate or Deactivate License menu item of your local TestComplete copy. If you have a Floating User license, activate it on your License Manager. For more information on activating TestComplete licenses, see Activating and Deactivating Licenses via the License Management Wizard. Select File | Install Extensions from the TestComplete main menu. 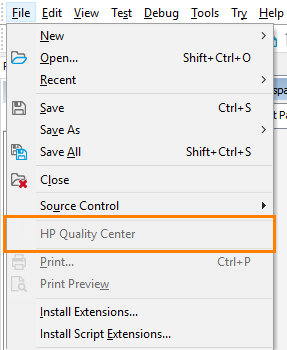 In the Common group of extensions, select the TestComplete Connector for HP Quality Center plugin. This menu item stays disabled until you open a project suite in TestComplete. Now you are ready to upload your TestComplete test projects into Quality Center and run them from Quality Center.